Traditionally, people missing all their teeth used to have only one option- dentures. However, with advancement in technology, people have a modern alternative to loosely fitted removable dentures. 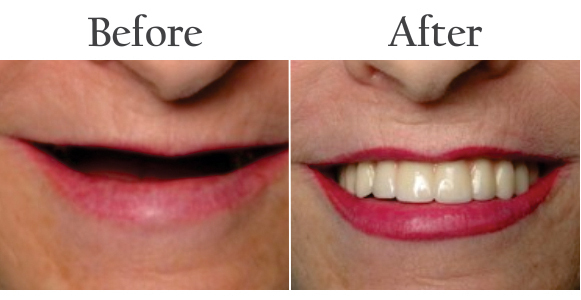 Implant dentures are the permanent solution to your problem of missing teeth. Unlike traditional denture, Implant dentures will be fixed on a sturdy bridge of 4 screws. These implant screw bridge will improve the fit and function over removable dentures and gives you an increased biting force. Implant dentures restore the old natural chewing capacity and save you from using dangerous adhesives. If you are missing all your natural teeth due to old age or any other severe mouth condition and looking for a permanent solution, implant denture is the best option for you. It is also a good option for people who are tired of uncomfortable ill-fitted dentures and want something cost-effective solution. Implant dentures on 4 length are the shortest type implant beneficial for people having severely resorbed jaw bone, and it also helps to maintain the facial structure. After examining and recording your present condition, we’ll explain you the entire process and give you various options that suits you best in the given situation. We have advanced pain management technology which provides you with a painless dental experience. We guarantee best dental solutions using only quality dental products during the procedure.